Wondering how an advanced production setup can be integrated with BlueFrame Technology? 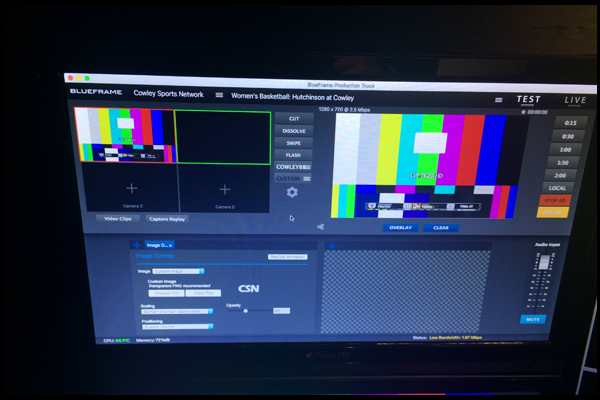 Below is a real life example of one of our current clients, Cowley College, and how their broadcast provider, Cowley Sports Network, is able to work with BlueFrame and their current remote production facility. Special thanks to our guest author, Zach Legleiter from Cowley Sports Network, for providing us an insight into their production setup! The Cowley Sports Network is the official broadcast and streaming provider of Cowley College. Based in Arkansas City, Kansas, the Cowley Sports Network (CSN) launched in November of 2007 as a streaming radio station, made the switch to video streaming in 2011, and in 2013 began using Production Truck software from BlueFrame Technology. In 2016 CSN reached over 100,000 viewers across its platforms. 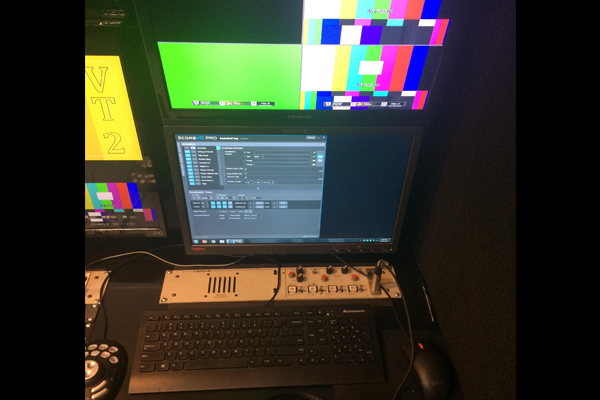 CSN utilizes the Production Truck software for streaming to cowleytigers.com/csn. Along with streaming to the website, CSN broadcasts are also available on the KJCCC Mobile App, and the NJCAA TV OTT App. In January of 2017 CSN and production services provider Legleiter Video Productions began a complete overhaul and equipment upgrade, including the construction of a state-of-the-art HD (4K capable) remote production facility nicknamed “TigerHD.” The project began as a 12′ x 6′ enclosed cargo trailer that we transformed into a “go anywhere, do anything remote production facility” in hopes to provide our viewers the same level of production quality as a network-level broadcast. The truck was built to ESPN specifications utilizing mostly Blackmagic Design products. The truck is wired for eight cameras, with four channels of instant replay, two channels of graphics, and we can even incorporate Telestrator! When we started this project, we knew there were five major things you need to make high-quality sports television; Switcher, Cameras, Instant Replay, Graphics, and Intercom. As with any production truck, from a 12ft cargo trailer to a 53ft double expando unit, everything revolves around the production switcher. 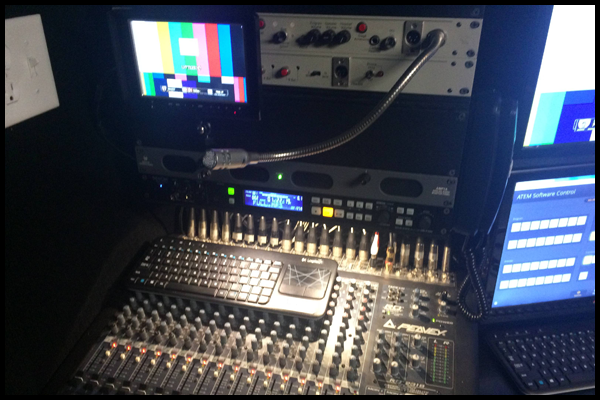 Our truck is equipped with a Blackmagic ATEM 2 M/E Production Switcher capable of up to 20 inputs and 12 outputs, with 4 keyers, 2 downstream keyers, and 2 media players, and independent customizable multiviewers through out the truck. The truck travels with three Sony PDW-F335 “Hard” cameras with lens options ranging from 17x to a 45x box lens with a 2x extender, and a Panasonic AJ-HDX900 “handheld” camera with a 10x wide angle lens. Two Sony HXR-FX7 cameras are used for “locked off” or “beauty” shots and for shooting clocks. 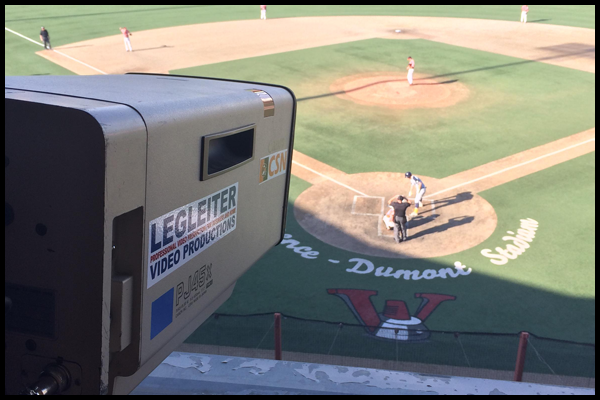 The truck also travels with a Marshall CV-502 POV camera for “point of view” angles on a volleyball or soccer net, behind the glass in basketball, and in the dugout or bullpen in baseball and softball. Camera signals are sent to and from the truck via the Blackmagic Design Camera Converter System. Single-Mode Duplex fiber optic cables are run to each camera. That single cable is capable of sending video and audio back to the truck, and tally, program, and intercom out to the camera from the truck. This leaves the only hook-up required at the camera location being power to the camera. Instant replay comes from a Lenovo desktop with a Xeon processor and a Blackmagic Design Decklink card running vMix Pro Instant replay software. The system is capable of recording up to four cameras and playing back two of those channels all at the same time! 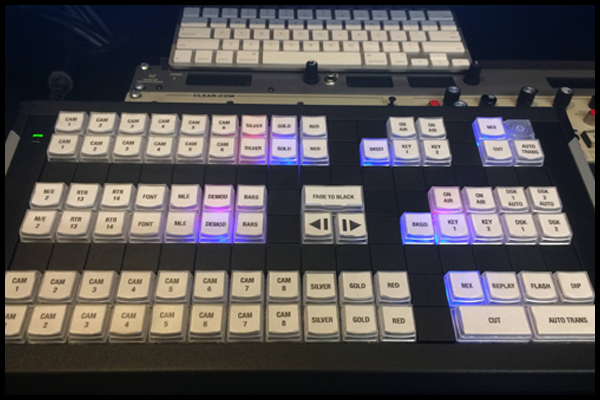 Utilizing the ATEM switcher’s auxiliary outputs, any of the switcher’s 20 inputs can be routed into the instant replay system with the click of a mouse. 4 TB of internal hard drive space allows us to record over 26 hours of 1080i HD video before having to start deleting files. The truck also has a Blackmagic Design Hyperdeck Studio Mini that records and plays back files from low cost SD cards. The unit has two output channels and can playback ProRes 4444 files with key and fill, making it great for element playback. The truck travels with Graphics Outfitters “ScoreHD” graphics system, and “ScoreOCR” Scoreboard data system. The system has pre-loaded customizable animated graphics package, and is capable of running the ESPN graphics package as well. Intercom is arguably (besides the switcher) the single most important piece of equipment in a production. Without intercom you can’t communicate, without communication you fail. Intercom is provided by a ClearCom 4-channel system with 16 outputs and telephone bridge. Each position inside the truck can talk on all four channels. The multiple channels allow for separate conversations to happen on each channel. Two of the four channels are “IFB” channels that allow the Director and Producer to talk to the Announcers at the same time or independently. Program audio is also available on each channel, so each user can listen to the announcers directly through their headset. The telephone bridge can be utilized to “dial-in” to master control, or if a telephone call needs to be made in the truck while the broadcast is on the air, the user doesn’t have to take their headset off as the telephone call can be routed directly though their headset. Audio is provided by a Peavey audio mixing console that has 16 inputs, with two pre-fade and two post-fade outputs. The truck has two announce boxes from Whirlwind Audio, each supporting Program and IFB audio going to the Announcer’s headset; the Announcer’s mic; and an additional “Talkback” channel (for announcer to director/producer communication, which mutes the announcers mic to the Air and routes it directly to a speaker inside the truck). Finally, the Production Truck software from BlueFrame is run off of an Apple Mac mini computer (500GB HD, 16GB RAM). Program video (and embedded audio) is input into the computer from the switcher via a Blackmagic Design UltraStudio Mini Recorder. We utilize the “Video Clips” section of the PT software for playing back commercial breaks. 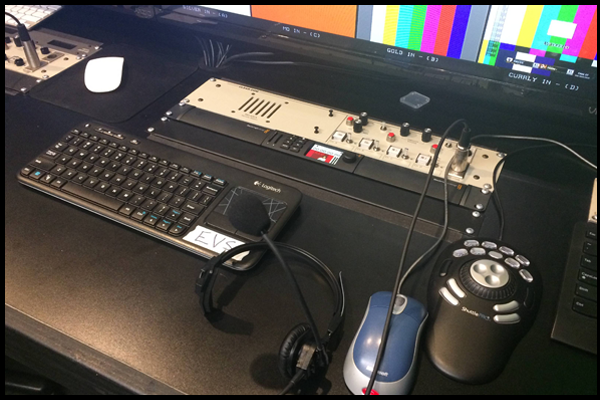 Additionally, we utilize a Blackmagic Design Hyperdeck Shuttle (USB 3.0) to output video from the Production Truck software’s program output section. That signal then feeds a fiber optic encoder that sends the final output (TX 1) to our local cable company for broadcast on a local TV channel. This allows us to not only stream our broadcasts on our website, NJCAA TV, and the KJCCC apps, but it also allows for a local audience on television all at the same time. « Get started with the new audio mixer in Production Truck!